"Australia, dreamtime, you continue to fascinate young explorers looking for a New World..."
There are a number of different ways people can travel... as with exotic decor ! 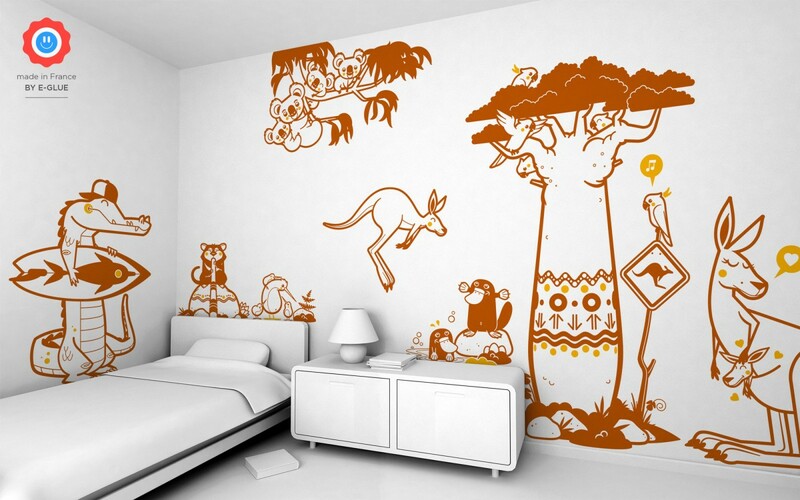 E-Glue can easily embark any kids by bringing the wonders of Australia and adding a wild style to the walls of their rooms. Around the giant sticker Baobab, all animal stickers Kangaroo, Koala, Crocodile, Devil of Tasmania and the little Kiwis are ready to be tamed. For example, see below a wall decal Crocodile (nut brown and golden yellow) applied on a light grey wall.